After a season of highs and lows and wasted opportunities, How I Met Your Mother finally made good on the potential of its final season. The show hit all of its marks with Bass Player Wanted, giving us touching moments between our favorite characters, reuniting Marshall with his wife and friends, and at long last allowing The Mother to live up to the fact that Cristin Milioti has regular castmember status. This episode is what Season 9 should have been all along. HIMYM wasted little time this week when it came to wrapping up Marshall’s journey to the Farhampton Inn. While it looked like the show was ready to continue to draw this plotline out, teasing a reprise of Marshall vs. The Machines, Marshall and Marvin were quickly picked up by The Mother. We’ve now seen Milioti appear in scenes with Josh Radnor, Alyson Hannigan, Neil Patrick Harris and Jason Segel, and like those scenes, the actress fit seamlessly with HIMYM’s established cast. It’s amazing how she seems to exude tiny pieces of each of the characters. Watching The Mother interact with Marshall was fascinating, as the character resembles Lily in both looks and, at times, personality. Of course, the fact that The Mother was wearing driving gloves made it clear that she is the perfect woman for Ted Mosby. I am curious to see how The Mother will interact with Robin. While Robin is (hopefully) going to marry Barney, she has always been the one-who-got-away for Ted. What will it be like when Robin realizes she’s talking to the woman Ted has long been searching for? During the ride to the Farhampton Inn, Marshall and The Mother got to know each other, with The Mother telling Marshall the story of how she had quit the wedding band, all because of a guy named Darren. Once a friend who The Mother invited to join her band, Darren took over the band and now planned to replace The Mother. In a move inspired by Aldrin Justice, The Mother stole Darren’s van … but planned on returning it gassed up and washed. Like Ted’s plans to move to Chicago, we knew that The Mother wasn’t going to skip out on the wedding. A butterfly somewhere has flapped its wings, and there’s no way now that The Mother and Ted won’t be exactly where they need to be this weekend. Thanks to Marshall, The Mother was inspired to return to the Farhampton Inn and reclaim her band.Back at the inn, Lily, Robin, Ted and Barney had already met this Darren. According to The Mother, Darren enjoyed befriending strangers in order to destroy friendships. His basic play went like this: Tell a pair of friends they’re hilarious and adorable, find some flimsy connection with where they’re from, share a fake personal story that’s a ripoff of a Disney movie, and then move in for the kill. Darren worked his evil magic on Lily and Robin, driving a wedge between the two over Robin rooting for Marshall’s judgeship to keep him and Lily in New York, and Lily focusing on her own problems during Robin’s wedding weekend. 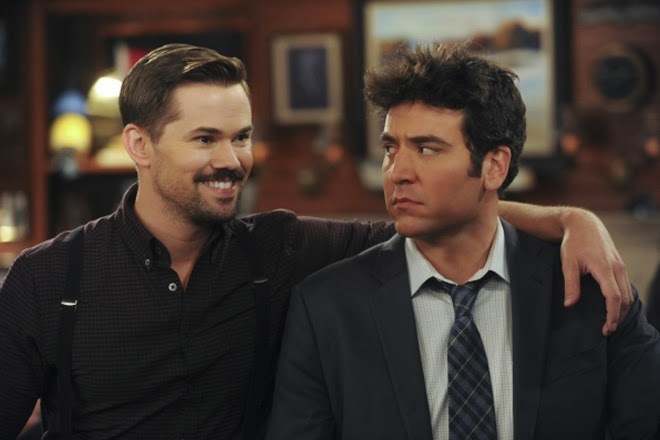 In a move almost as dark-hearted as Daphne (booooo …) calling Lily to tell her that Marshall had accepted a job as a judge, Darren let it slip to Barney that Ted was moving to Chicago. There are a handful of times on HIMYMwhen Barney has expressed true hurt and real disappointment. The time he took down the basketball hoop at his dad’s second family’s house was one of those times. Realizing that Ted was moving to Chicago the day after the wedding was another. “You were going to give me one day’s notice?” a very hurt Barney asked Ted. When Ted replied that he didn’t want to upset Barney on his wedding weekend, Barney fired back. “No, it’s good. It’ll be easy to say goodbye now that I know how much I mean to you.” For years, Barney has referred to himself as Ted’s best friend. He meant it, and now Ted had really hurt him. Ted and Barney had a moment of their own, with Ted giving Barney yet another bottle of Glen McKenna Scotch. The first two bottles had been dropped, but Ted was willing to commit grand larceny and steal a bottle of the super pricey Scotch. What better way to let Barney know that he would go to jail for him? Going to jail for your friend is the dream, right? Barney was still hurt by the fact that Ted was moving away. As he explained it to Ted, Barney figured that even with Marshall and Lily gone, they would only be away for a year, and that Barney, Robin and Ted would still be friends in New York. This was the moment when Barney understood why Ted was leaving: Robin. “I need a new start,” Ted told his friend. As Lily continued to beat up Marshpillow, her real husband finally made it to the Farhampton Inn. Lily calls for a pause, allowing the Eriksens to reunite without getting drawn into a fight over Marshall’s judgeship. HIMYMreally dug into its history with the pause, recalling a plot point from the Season 1 finale Come On. Marshall and Lily’s pause system allowed the couple to suspend their fights. I’m not sure what this means for Marshall and Lily now. The last time we saw the pause system in action, Marshall refused to let Lily pause their fight over her moving to San Francisco to take an art fellowship … which led to them breaking up. The Jan. 20, 2014, episode of HIMYM is called Unpause, so we’ll have to wait about a month to see how well the pause system works this time. With Marshall back, the gang tried to celebrate with a round of Glen McKenna, only to have their gathering ruined by Darren. The Mother had made it to the inn (which prompted an all-caps celebratory sentence in my notes for this episode) and had come to the realization that she couldn’t fire Darren. As The Mother gave her own voiceover speech to Linus the bartender about how karma doesn’t always deliver a knockout punch to villains, her future husband saw to it that karma would come through. Sure, Ted couldn’t fight guys behind MacLaren’s, but when it came to the guy who tried to ruin his friendship with Barney and who wrecked an expensive bottle of Glen McKenna, Ted was willing to throw a punch. After getting up, Darren stormed over to the bar for ice, giving The Mother the chance to laugh at him. Darren could take no more — he quit the band. Ecstatic, The Mother told Linus that she would like to buy the best man who punched Darren a double shot of the bar’s finest Scotch. And that, kids, is how The Mother first bought Ted a drink. Even though we didn’t see The Mother and Ted interact during Bass Player Wanted, there was something pretty awesome about this moment. We’ve seen flashforwards of Ted and The Mother together, but this was the first moment when the two realized the other person existed. The Mother hadn’t met whoever this best man was, but she knew that he had defeated one of her villains. And Ted? Well, Ted was just excited that someone bought him a glass of Glen McKenna 35 Year. Yes, the Farhampton Inn bar had Glen McKenna the entire time … and the finale was awesome. During HIMYM’s off week, I looked at the five best and five worst parts about Season 9. The show did a great job this week of focusing on those strengths and finding ways to fix those negatives. Marshall is back with the gang. The Mother was treated as a full character. We were treated to several moments that reminded us that this group of friends shares a special bond, and thankfully, we got to focus on them this week instead of some random character. We know that there are rough patches still in store for the story this season. Marshall and Lily will have to unpause their fight at some point. Ted winds up with a bandaged hand somehow (or was this episode’s punch the cause of that bandage?). But as long as HIMYM sticks to what made this episode great, Season 9 still has some promise. According to Marshall, Bigfoot exists but he stopped smoking years ago. I still want to see a HIMYM/Finding Bigfoot crossover. So no one ever asks The Mother what her name is? Obviously Barney didn’t in his flashback encounter, but Lily and Marshall have both spent considerable time with this woman. I’m assuming we’re supposed to believe they found out her name, but it was off camera. Marvin’s real first words were “skunk chunks.” Lily will never know, though. Happened to run across the name of the actor who plays Linus, the go-to bartender for The Kennedy Package: Rob Belushi. He’s the son of Jim Belushi.